I don’t know what I would do without our crock pot. It’s so easy to throw a meal together in the morning and by dinnertime, there’s something yummy ready for everyone. 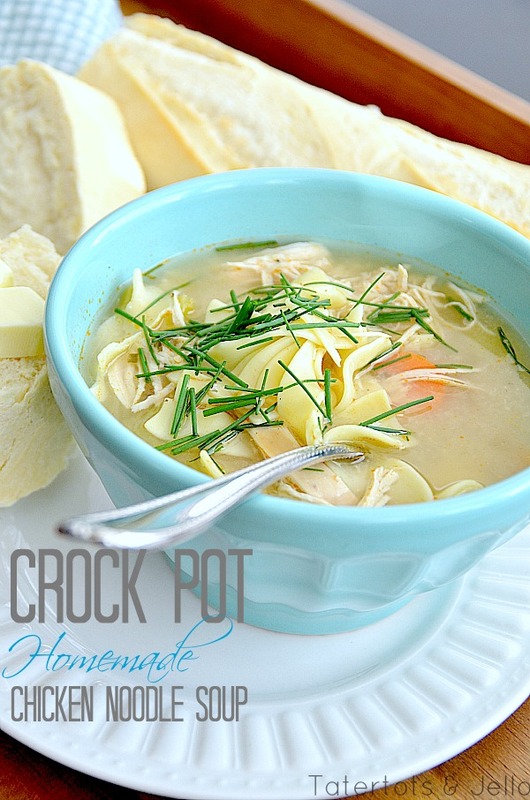 One of our favorite crock pot recipes to make in the colder months is our Crock Pot Chicken Noodle Soup. It just hits the spot on a cold winter day. I showed a picture of the soup cooking on Instagram last week and had quite a few people ask for the recipe. So here it is!! As with every slow cooker recipe, this is a very easy recipe, but be sure to start early enough in the day to allow cooking time. Slice carrots and any other veggies into small slices - whatever size you like. 6-8 hours later, approximately 30 minutes before serving, check the chicken for done-ness with a fork (it should fall apart easily and have no pink color remaining). Start the water boiling to cook the egg noodles. While you're waiting for the water to boil, take the chicken breasts out of the soup and place on a plate. Fork shred the chicken and put it back in the soup. Cook the egg noodles according to the directions on the package. To serve, place some egg noodles in the bottom of the individual bowls and scoop soup on top. If you're using fresh chives, you can garnish with those. You can adjust the quantities in this recipe for the size of your family and your slow cooker. Feel free to add other vegetables you'd like, like onion, or feel free to omit the celery We keep the egg noodles out of the soup because we get the crock pot so full when we do the soup in the first place. If your broth seems to run low after serving, you can always heat up another can of chicken broth and add it to the slow cooker. Excellent with fresh-baked bread (yes it's okay if you buy the bake at home bread) Mix remaining soup and noodles together to store leftovers. Do you love using YOUR slow cooker?? Let us know in the comments. We would love to come over and see YOUR favorite recipe!! Favorite Slow Cooker Recipe: Tuscan Potato Soup! Easy Slow Cooker Mexican Posole Soup Recipe! Great Ideas — 25 Ways to Brighten Up Your Home!! Love this recipe! It’s in the 30s here in Houston so I’m making this tonight! Yum!! Just wanted to say that I absolutely love this recipe! It works well with the noodles, but the next time I make it I will be doing it without the pasta. I put so many veggies in it that the soup is fantastic on its own. All you need is a slice of buttered bread on the side and it’s perfect! 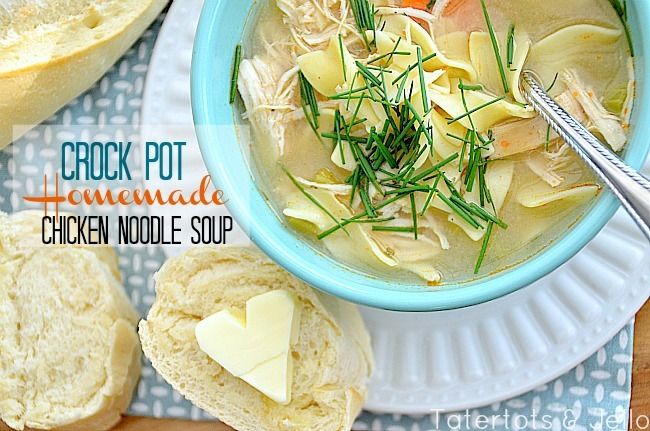 This is my new go-to recipe for soup! No sorry Jennifer. I wonder how you figure that out? I LOVE Chicken Noodle Soup! 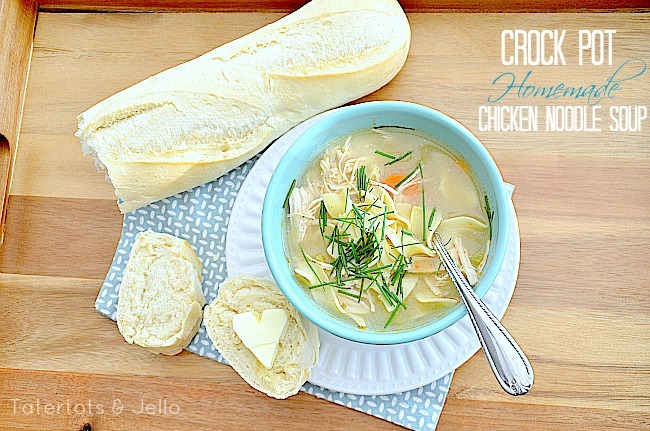 I’ve never made it in the crockpot, but I’m pinning to do just that! Thanks so much for sharing. Nom nom nom. Didn’t have two cans of cream of ckn so I used one and the other was cream of mushroom. Also got FAT egg noodles from trader joes! This sounds delicious. Thanks for sharing the recipe! Thanks so much!! I just took a photography class and I am working on learning haha!! Pinning this for later! My go to crock pot meal is cheater chicken and dumplings…a pack of chicken breasts, a can of broth, 2 cans of cream of chicken, basil and thyme for 4.5 hours…then flatten and cut into fourths a can of grands biscuits, cook for another 1.5 hours. It is always a hit! Wow Erin!! That sounds so good!! Thanks for sharing the recipe. I will be making that soon!! This sounds great! Do you cook on high or low? Soup perfection. I love the heart butter! Well, I was already starving…now I’m really hungry. Got an extra bowl? That looks great. I’ve pinned it to save the recipe to try soon! I love slow cooker recipes. Can’t beat tossing stuff into it and having a ready-to-serve meal in just a few hours. Chili is my go-to slow cooker meal but I love trying new ones. Thanks for sharing! I love making chili too! Thanks for the comment!! Oh, this looks so warm, yummy and comforting!! The crock pot is as important as the kitchen sink, maybe even more 🙂 Thanks for sharing the recipe with us, Jen. Thanks Angelina!! I agree – crock pots are a must! Have a great day my friend!! My go to recipe that never fails is chicken tacos in the crock pot. Frozen Chicken breasts, and a jar of salsa. That’s it!!! Cook and then at the last 30 mins I choose to add 1 can black beans and 1 can trader joe’s corn. Sooo good!! And it yields so much that I have left overs for days. That sounds so easy!!! I am going to make it this week. Thanks Amy!! This looks delicious! Not feeling so great today, so this would hit the spot. Thanks Ashley!! I hope you feel better.